Glass fiber manufacturing is part chemical, part mechanical. Strands of glass and carbon are drawn into fibers then heated to high temperatures to expel the majority of non-carbon atoms in a process called carbonization. The process creates filament-like fibers composed of tightly woven chains of glass/carbon that when laminated into sheets makes exceptional knife handles that are lightweight, visually pleasing and wear-resistant. Conventional glass fiber is woven, basket-like, horizontally and vertically but our Japanese makers have developed a new weaving process that creates circular and swirled fiber patterns called Nishijin. Spyderco combines a Nishijin glass fiber handle, with custom knifemaker Bob Lum's Chinese Folder design resulting in an Asian-influenced CLIPIT exuding the simplicity and function of traditional Chinese cutlery in a modern superior cutting tool. Inside the Nishijin handle scales are full-length liners and a Michael Walker LinerLock'. The blade is wider at one end, tapering to a point like a leaf and offers a pointed tip for detailed, precise cutting and plenty of width across the blade for serious cutting chores. The VG-10 steel blade is full flat-ground with a PlainEdge cutting edge and a swedge ground from the spine adding style and lessening overall weight. 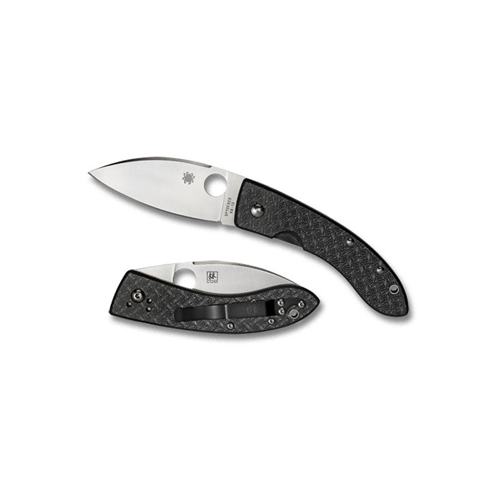 A black three-screw metal clip carries the folder right-handed tip-up/tip-down. Bob Lum passed away several years ago but his folding knife designs continue influencing American cutlery and his Chinese Folder offers Spyderco the opportunity to continue his talented legacy.